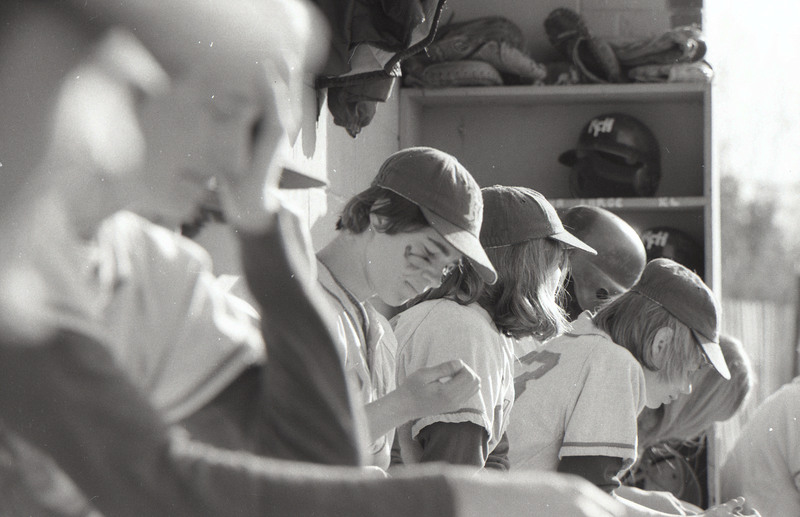 You may recognize at least one of these RFH boys from the baseball practice pile-up prank in our recent Retro Pic of the Day. Call it playing ball peppered with a little spring fever. 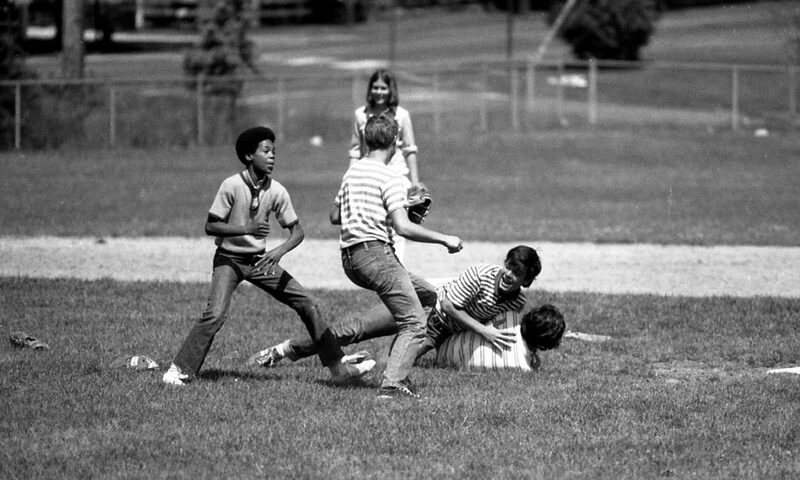 Isn’t football the tackle sport? 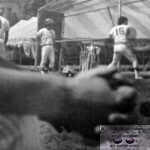 Well, that may be, but by the looks of things in this 1970s home run classic in the outfield, these RFH baseball players paid no mind to standard sports protocol. It was really all about the fun and laughs for them. While baseball season at RFH started earlier in the month, today marked the start of Major League Baseball season. 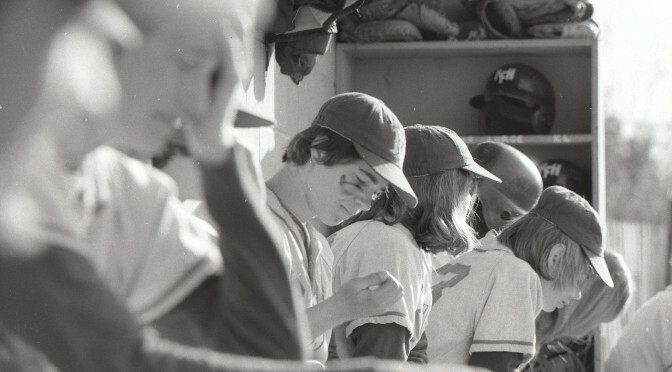 As the the after-effects of the sopping home run of a nor’easter settle into the ground and sign-of-spring buds peer from under the snow-capped slush, RFH’s baseball season is set for full bloom opening two home games on Saturday. It’s not only still baseball season at RFH, it’s Friday the 13th. 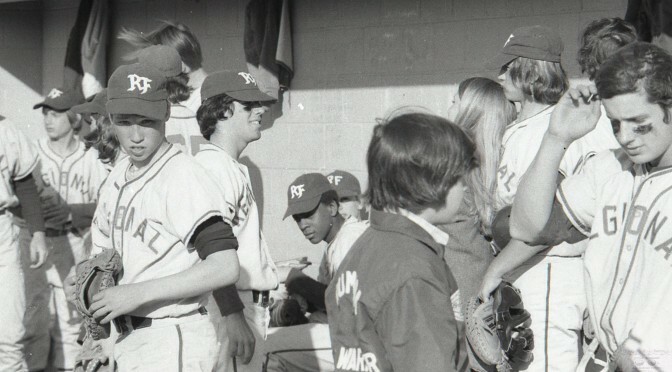 So, in the spirit of good luck, the Retro Pic(s) of the Day feature some successful ball playing of the 1970s with a beloved coach whom many felt charmed the game — Hal Lorme. Lorme passed away just over a year ago. 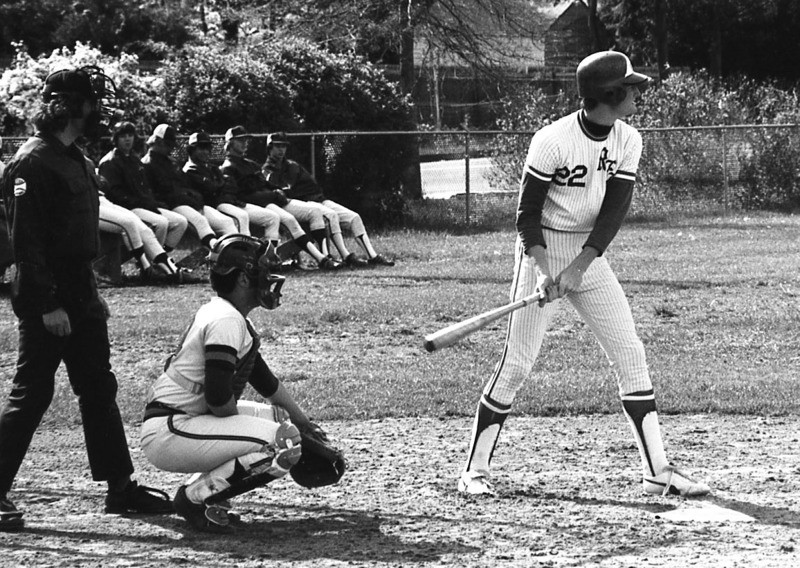 He is still fondly remembered by many an RFH alumni and ball player. In the top featured photo, Lorme is seen with ball player Tripp Dupree. Below, he’s behind and in the scenes coaching. Recognize anyone else? 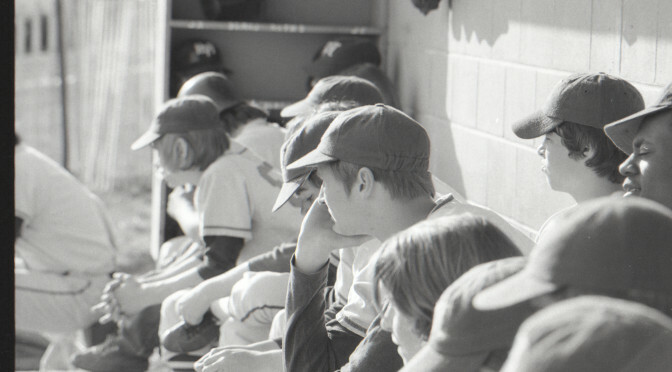 RIP, Coach Lorme. May the luck of Lorme be with today’s team! Spring is in the air — well, sort of. 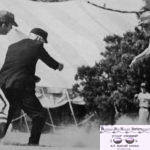 So, to honor the immediately impending coming of spring, our Retro Pic of the (George) Day also commemorates the coming of the baseball season. 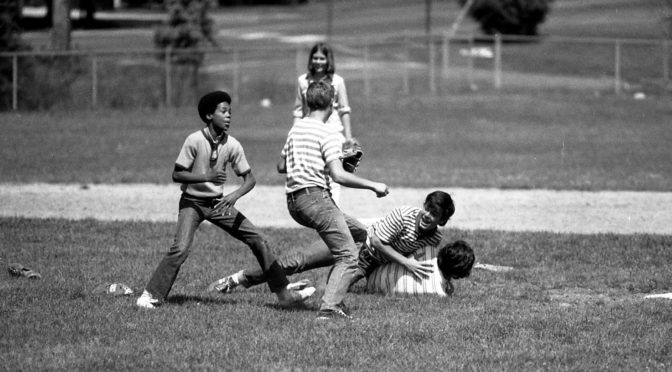 Here’s a shot from the 1970s of some RFHers playing ball. 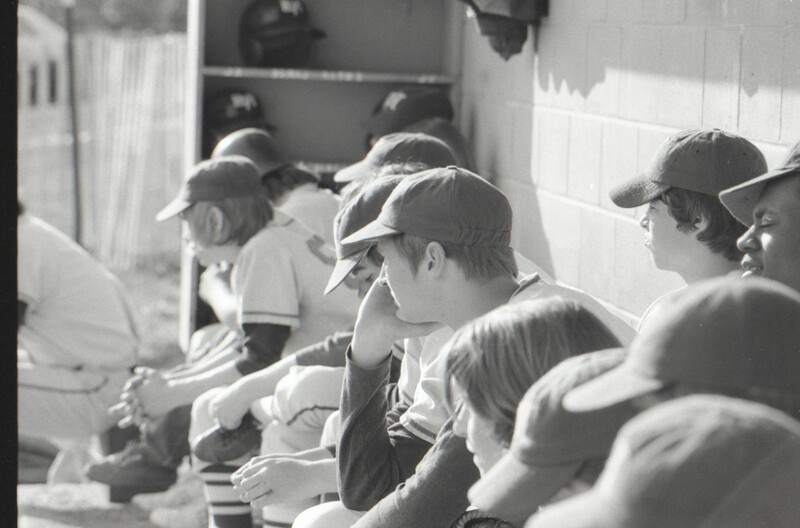 Thanks, again, to George Day for this and so many other great photos! Anyone with a pic from the past, please send it to us, with proper credit, at evd@rfhretro.com, and we will feature it as a Retro Pic of the Day. 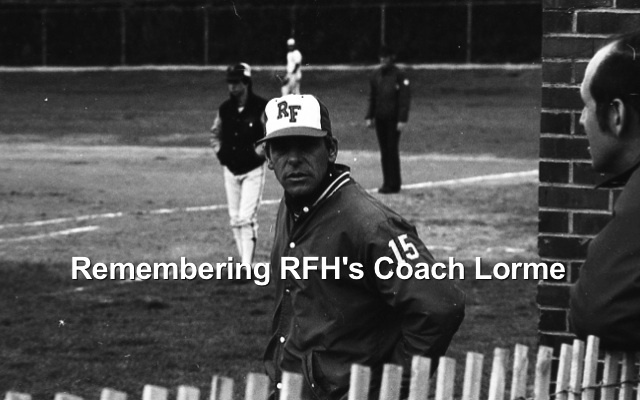 The news of former Rumson-Fair Haven Regional High School (RFH) coach, gym teacher, Ski Club director, RFH Athletic and Jersey Shore Sports Hall of Fame inductee Hal Lorme hit the community with a wave of sadness. While Lorme died on Feb. 15 at his assisted living home in Myrtle Beach, SC, his obituary was only recently released by Thompson Memorial Home with the pending remembrance service for the coach originally slated for Thursday, but now scheduled for Sunday from 3 to 5 p.m. at Thompson, with a prayer service at 4:30. When longtime Fair Havenite, RFH grad and Rumson police officer Bryan Dougherty posted the news on the Fair Haven Facebook page on Tuesday, the post was flooded with warm memories shared of the coach. “Ohh this is so sad to hear! What an icon he was at RFH,” Susan Kaltenborn Marino said. “Thanks for all you did. RIP,” said Steve Howie. “Loved his sense of humor. RIP coach,” said Jack Kavanagh. Harold A. Lorme “Hal”, 82, formerly of Oakhurst, passed away Sunday, Feb. 15, 2015, at Reflections Assisted Living in Myrtle Beach, SC. Hal was born in Jersey City on Nov. 23,1932, a son of the late Harold and Margaret Lorme. He was predeceased by his brother-in-law, Patrick Murray. Hal attended Snyder High School in Jersey City and went on to graduate from Montclair State College. Hal served in the U.S. Army in Korea, rising to the rank of Sergeant. 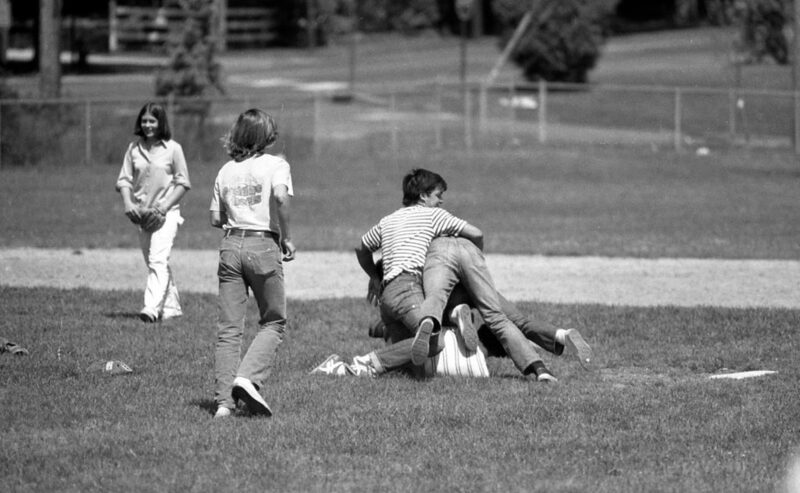 He was a Physical Education teacher at Rumson Fair Haven Regional High School for 31 years. 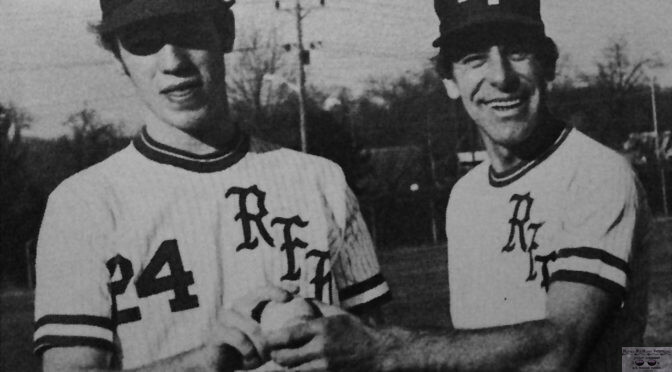 He coached Varsity Wrestling for six years and Varsity Baseball at RFH for 25 years. 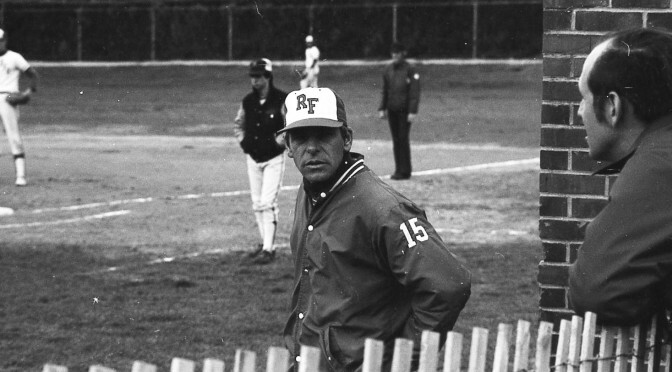 Hal was extremely proud to have won 324 baseball games during his coaching career at RFH and to have the baseball field at RFH High School named in his honor. He was inducted into the RFH Athletic Hall of Fame in 1986 and inducted into the Jersey Shore Sports Hall of Fame in 2006. Hal enjoyed directing the RFH High School Ski Club for 12 seasons. During the summers, he worked as a cashier at Monmouth Park Race Track in Oceanport, NJ. He was a communicant of St Andrew Roman Catholic Church in Myrtle Beach. Hal was a die-hard NY Yankees fan, enjoyed many trips to the Bronx during the summer and trips to Florida during Spring Training. His passions were collecting baseball memorabilia including many Yankee items, officiating High School football games in the shore area, playing softball and enjoying a round of golf. His greatest enjoyment was spending time with his grandchildren especially watching them play sports. Hal is survived by: his wife of 62 years, Joan Lorme; son, Hal J. Lorme and his wife Tracy, their children, Ryan, Meghan and Matthew, all of Long Branch; daughter, Jacquie Lorme and her son Raymond of Fargo, ND; sister, Doris Murray of Lincroft, and nieces, Lynn, Cathy, Cheryl, Colleen and nephew, Patrick. A special thank you to Hal’s niece, Colleen and husband, David O’Hagen, who have been such a big help to Hal and Joan over the last few years.